Published in Rafu Shimpo, July 3, 1969. Opening dinner at George Lim's restaurant in Chinatown, Los Angeles, California, June 30, 1969. Lim is a skinny man with a high forehead in a suit and striped necktie. 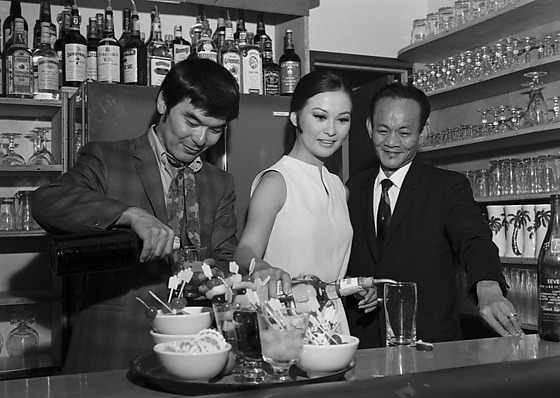 Includes group portrait of eight men and women, man and woman pouring drinks at a stocked bar as Lim watches, and portrait of Lim with man who tended bar. Typed on original envelope: George Lems Dinner -- Open House -- 840 N. Hill St.